We offer a full line of air conditioning and cooling products. 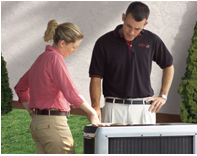 We offer a full line of furnaces & heat pumps. Bainbridge Heating and Air is Kitsap County's premier source for heating and cooling solutions. Based on Bainbridge Island, we're proud to serve this wonderful community we call home. Whether your heat source is propane or electric, we have solutions for your needs! We provide new sales, service, and installations of heating and air conditioning equipment, and fireplaces. With excellent brands such as Coleman and Daikin, we are committed to providing you with systems that meet the unique needs of your home or business while maintaining the highest possible energy efficiency. Bainbridge Heating and Air also offers an Energy Savings Agreement (ESA): An annual service contract that keeps your equipment running in top shape and saves you 15% on repairs if you need them!! We are a fully-insured, licensed, and bonded heating and air conditioning company serving all of Kitsap County (including Bainbridge Island and North Kitsap) as well as portions of Jefferson County. We look forward to serving our Kitsap County Neighbors! Get your system working again!